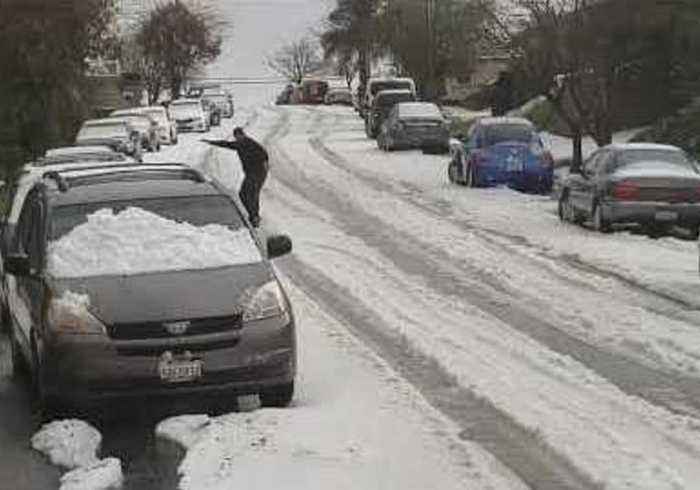 A snowboarder made the most of a wild hailstorm that covered a San Jose street in a thick layer of hailstones on Sunday, March 10.Locals took to social media to show their surprise after the storm, with many sharing images and videos of blankets of hail resembling snow.This footage, provided by local man Aaron Scheid, shows a snowboarder sliding down a hail-covered street in San Jose.The storm brought lightning and thunder to parts of California’s Bay Area. 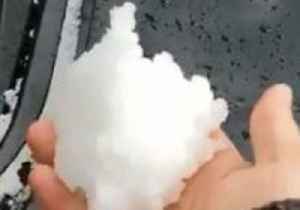 Residents in the south of Spain were stunned when they were hit by a severe hail storm. 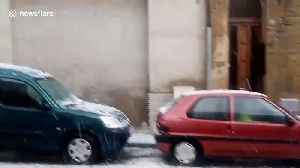 Footage from Tuesday (April 9) afternoon shows how the thick white balls of ice pummelled cars parks in a road..
Hail rains down on a street in Madrid in a dramatic shift of Spring weather. 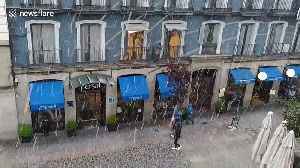 Footage was shot from a balcony showing slanting hail hammering a street in Madrid with people walking below, presumably..
Long Beach residents were treated to a “snow day” on March 20, when a storm hit the area, leaving a blanket of hailstones in its wake. 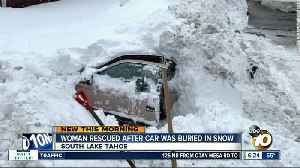 Local media reported the storm resulted in road closures and..
Long Beach residents were treated to a “snow day” on March 20, when a storm hit the area, leaving a blanket of hailstones in its wake.Local media reported the storm resulted in road.. 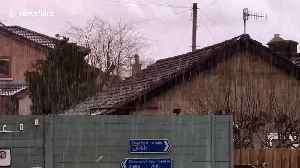 Severe gales pummeled parts of the UK today, while large hail hit this home near Oldham. A variety of weather warnings for wind, snow and ice have been issued from Sunday (March 10) to Wednesday,.. 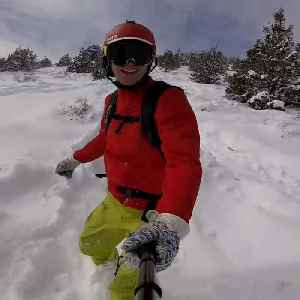 This guy took advantage of the snow storm that hit his town by deciding to go snowboarding along with his dog. 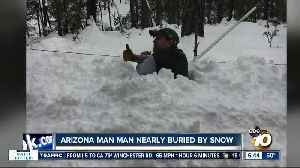 The excited tog tore down the hill at a fast pace behind his owner enjoying himself to the..
Marv Orsburn was almost buried alive after snow slid off the roof of his home and onto his head.